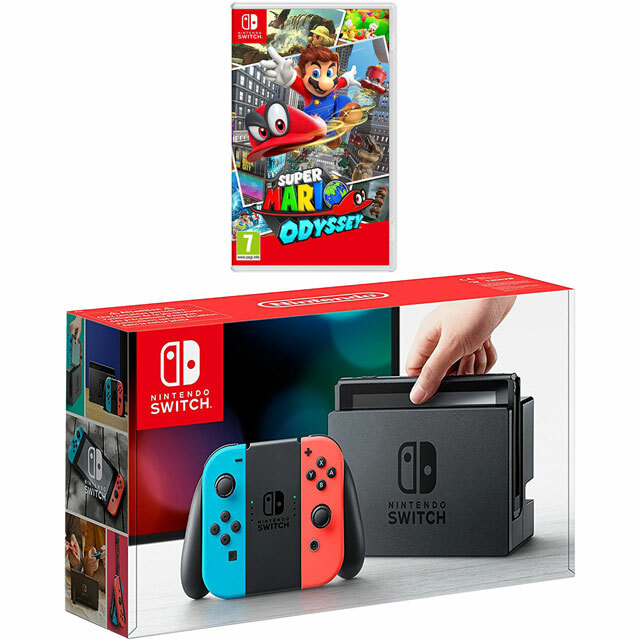 Free yourself from your sofa with this Nintendo Switch games console. 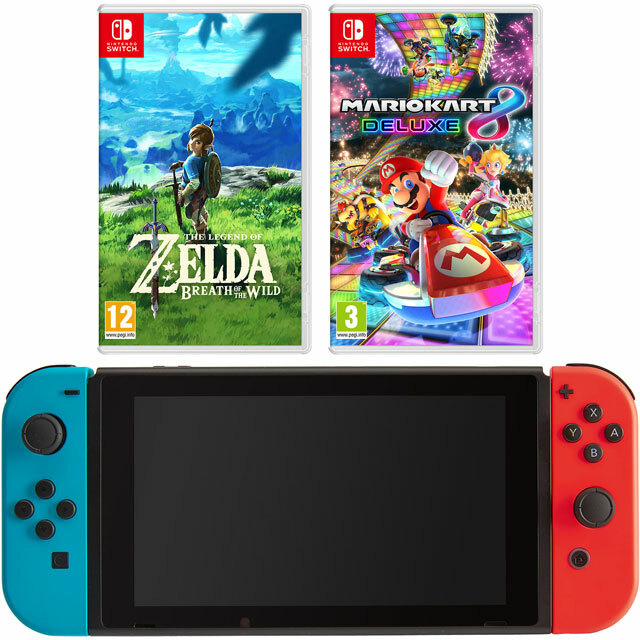 As well as connecting to your TV for traditional gaming, it can also be taken out and about to chase high-scores on-the-go. 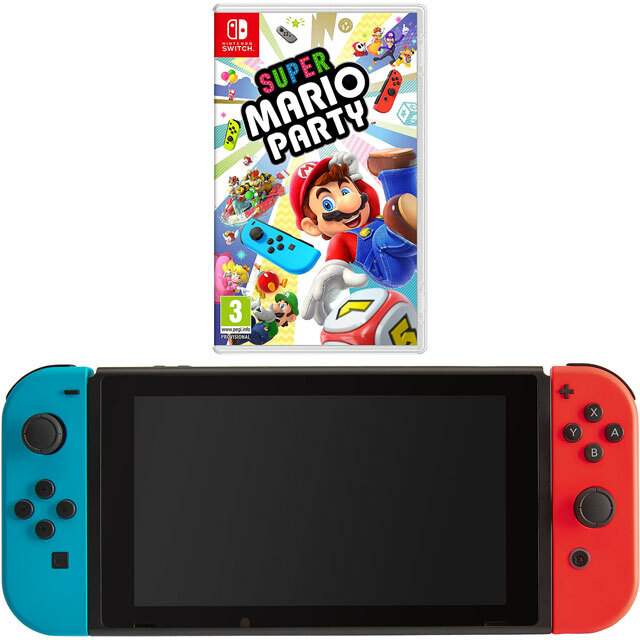 It features a touchscreen for intuitive ways to play when you’re in handheld mode, and can connect to your WiFi for online competition. The battery will last for up to 6 hours when you’re going portable too. 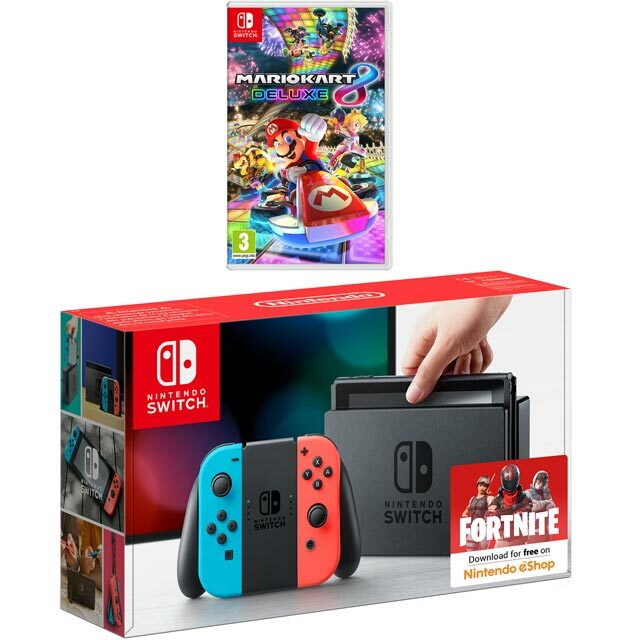 Plus, the included Neon Blue and Neon Red Joy-Con controllers can be used together for intense single-player experiences, or you can hand one to a friend for epic multiplayer battles. 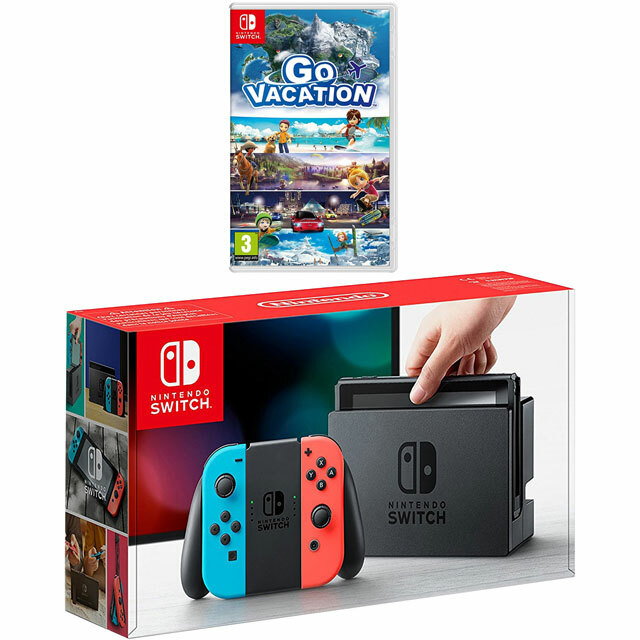 This bundle includes a physical copy of Go Vacation. Head out on a holiday packed with activities, exploring 4 different paradise resorts packed with over 50 different sports and challenges. Up to four friends can all compete in split-screen competition too, or grab an extra Switch for local wireless play. With the Nintendo Switch, versatility is the name of the game. Keep it docked and you’ll get the traditional, cinematic gaming experience on your TV. If you’re heading out, simply lift the console out of the dock and immediately pick up where you left off on its dedicated screen. And if you bump into a friend, pop out the kickstand, remove the JoyCon controllers, and play together in table-top mode. As you’re no longer tied to the sofa, you can keep gaming whenever, wherever, and however you like. Navigate menus and experience unique gameplay mechanics thanks to the system’s touchscreen. You can tap and swipe your way through the online store to find your next must-have purchase. Once you’re in game, you’ll be able to solve puzzles, command troops, or just draw sketches with a swipe of your finger. Get even more gameplay using the built in NFC reader. By scanning certain figures such as amiibo, you can unlock additional content for your favourite games, from character outfits to extra modes and weapons. This gives you new ways to play, and allows for more customisation to help you stand out from the competition. Great product. Exactly as described and easy to use. My children are able to use it with ease fabulous for all the family to play together. Thank you ao. Fantastic "real" games console in a tiny portable package! Memory a bit smaller than I would like, but was easy and cheap to upgrade. Never thought it would be such entertaining. Graphics are awesome and the games are the best I ever played so far. Specially games like this and Super Mario Odyssey are from another league. I just have no words. It's wonderful. And the service from AO was top class.